Our certified service department is staffed with factory-trained technicians who know how to get the job done right the first time. Experience worry-free vehicle service and maintenance at Rome Pre-Owned. Any driver knows that the better you care for your car and keep up on routine maintenance the more smoothly and hassle-free your vehicle will perform. One of the essential parts of caring for your used Ford, Chevrolet, Dodge, Hyundai, or Jeep is performing routine maintenance like oil changes and tire rotations. Adhering to the service schedule in your owner’s manual will ensure your vehicle runs efficiently and safely. 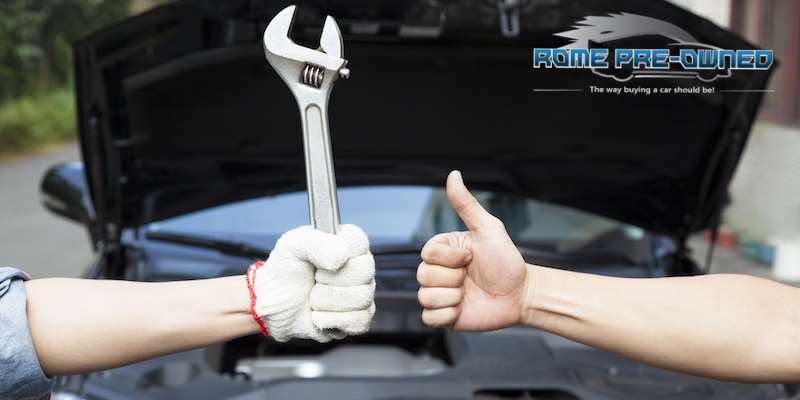 Rome Pre-Owned Auto Sales maintains a fully staffed Service Department with factory-trained mechanics on standby; ready and able to help you with everything from routine maintenance to major repairs. Our service team is trained specifically to work with the vehicle makes we sell, including the entirety of the Ford, Chevy, Hyundai, Jeep and Dodge lineups. Our experts can even handle difficult repairs on foreign luxury and performance models. If you have a need for a routine procedure like an oil change or brake check or something more intensive, like a major vehicle repair, we’re here to help you. Simply fill out the online form below to alert us to your automotive needs. Our service staff is here to help you get the most out of your pre-owned vehicle and keep it running smoothly for years to come. You can submit the form below to schedule a vehicle service or repair appointment, or Contact Us anytime with your questions. We’re here to make sure you and your vehicle get the very best of our efforts.